Try this. Take a map of the Indian Ocean and turn it upside down. The disorientation brought upon by the primacy given to the vastness of the high seas returns a sense of proportion to the world at India’s shores, but it still takes some adjusting to. The new Great Game is said to be playing out on the waters of the Indian Ocean, and to get its measure, it is useful to be shaken out of our landmass-centric view of geography. Look at the map, this way and that. Last week, when Thai Prime Minister Yingluck Shinawatra arrived in Delhi as the Republic Day chief guest, she invited India to look at the map again. Speaking to business associations, she focused on her government’s participation in the development of a deep sea port in Dawei, on Burma’s Tenasserim coast along the Andaman Sea. On most maps you will find the town listed by its old name of Tavoy, and it lies practically on the same parallel from the equator as Chennai. The project’s eventual development cost is billed at more than $50 billion, and a highway will cut across the Thai-Burmese peninsula to connect it to Bangkok, and possibly beyond. 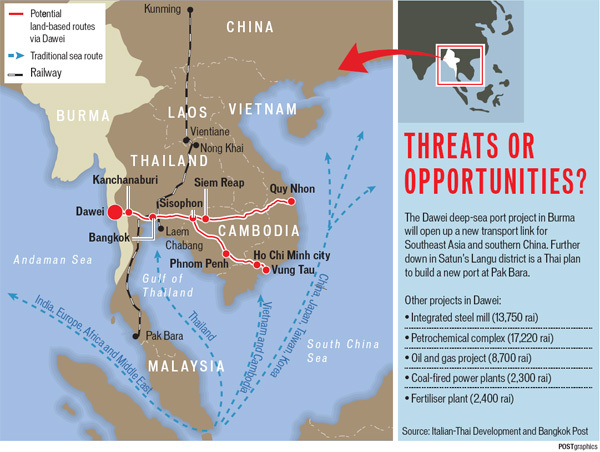 The seductions of the Dawei project are obvious. In a way akin to that in which the Panama and Suez canals freed ships of long-winded and hazardous passages around the South American and African coasts, it could change maritime maps by liberating trade from the Malacca Dilemma. The long, narrow passage between Malaysia and Indonesia’s Sumatra island is currently the only viable connection between the Indian and Pacific Oceans, and worries about obstruction closing off the Indian Ocean in the east are understandable. It is a busy thoroughfare. An estimated 40 per cent of world trade must pass along it. While more than 80 per cent of China’s oil supplies pass through the straits, the percentage of Indian trade moving along is substantial too. A passage by way of Burma’s Tenasserim coast would not just cut a journey’s length, it would reduce the risks of traffic and pirates as well as address the security implications of a sole viable route presented at the Malacca Straits. But to understand why the Dawei option is now more salient, look at what else just transpired in this town that routinely invites the adjective “sleepy”. This weekend Dawei was the first port of call outside of Rangoon for Burmese pro-democracy leader Aung San Suu Kyi as she embarked on a countrywide campaign for her National League for Democracy for by-elections scheduled for April 1. In front of crowds that showed up to cheer her, she committed herself to working for deeper democratic change from within parliament. It was a reminder that the Great Game east of India is taking place in a manner vastly different from that in its northwest: the Asean (Association of Southeast Asian Nations) region is becoming more stable politically and more outward looking. To ease itself out of anxieties brought on by China’s fabled “string of pearls” port encirclement of the subcontinent, India must widen and texture its partnerships. It must, above all, think big and bold in participating in remaking the coastal maps. In Where China Meets India, his travels through Burma and its often restive peripheries, Thant Myint-U invites the reader to survey demographic and political changes in the three countries in a more integrative way than the turf-oriented strategies being outlined in and around Afghanistan. As land and sea connectivity becomes the axis along which Asian nations will increasingly strategise, rivalries will not be zero-sum games and will in fact thrive on overlays of economic and military partnerships. It is not a coincidence that Myint-U concludes his inquiry with a tour of Tavoy. Looking past the sleepy town with its British-era bungalows and unspoilt beaches, he sees a possible future: the Indian and Pacific Oceans connected to render the loop around the Straits of Malacca, railway lines from Yunnan connecting to Laos, Thailand, Cambodia, oil tankers from the Middle East docking here and oil being pipelined to and past Southeast Asia, and a highway through Burma connecting Tavoy with Manipur and Assam. And what of the eastern seaboard along the Coromandel coast? In a book just out, Merchants of Tamilakam (Pioneers of International Trade, the Story of Indian Business), historian Kanakalatha Mukund invites us to re-examine that map another way to lend it temporal depth. In a study spanning the millennium from the Sangam age (1st to 3rd century CE), through the rise of the Pallavas and Pandyas (6th century to 10th century), to the age of the Chola (9th to 13th century), she charts out the bazaars and the trade that sustained the first waves of urbanisation along the coast of what is now Tamil Nadu, as merchants traded with the Mediterranean region and Southeast Asia. Underlying this dynamism were institutional and political structures that made possible a more modern economy, allowing commerce with and between far-flung areas and integrating the internal economy with overseas markets. Where Myint-U finds colonial-era towns on the verge of being catapulted to hectic activity as a new crossroads of Asia, Mukund brings alive old texts to evoke the smells and cosmopolitanism of long-ago hubs. Today’s container and tanker traffic may not hold the promise of reviving the romance of the bazaar, but it is nonetheless a call to pay a quiet nod to the seafarers of centuries past whose quest for new routes still animates visions of the future — and to that age-old lesson about the benefits that accrue when administrations enable mercantile activity.